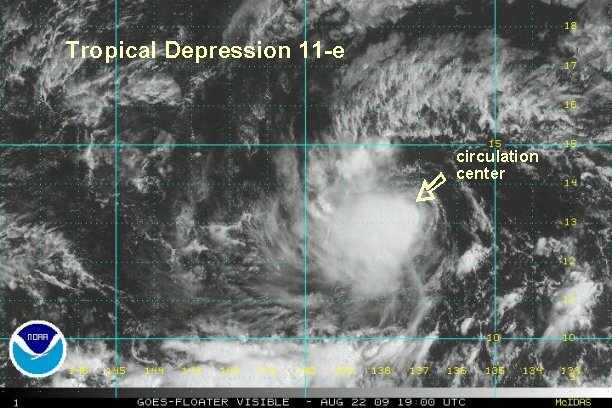 It looks like tropical depression 11-e is now about to be classified. Deep convection is seen on I.R. satellite imagery and the Quickscat shows a closed surface circulation with some winds to 30 knots. 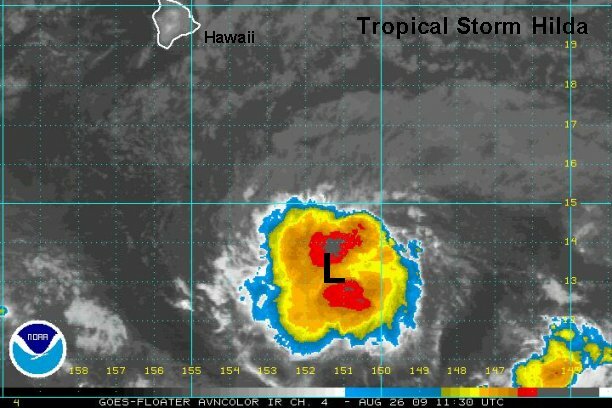 As of 10:00 am edt / 7:00 am pdt the tropical disturbance is centered near 12.2° N / 137.2° or about 1300 miles east southeast of Hilo, HI. Top sustained winds are estimated at 25 mph. It is moving west at about 15 mph. Visible satellite imagery shows easterly wind shear affecting 11-e. Deep convection continues to remain near and to the west of the circulation center. The tropical depression is on the border of becoming tropical storm Hilda. If it is named before it crossed 140° W it will be named Hila. 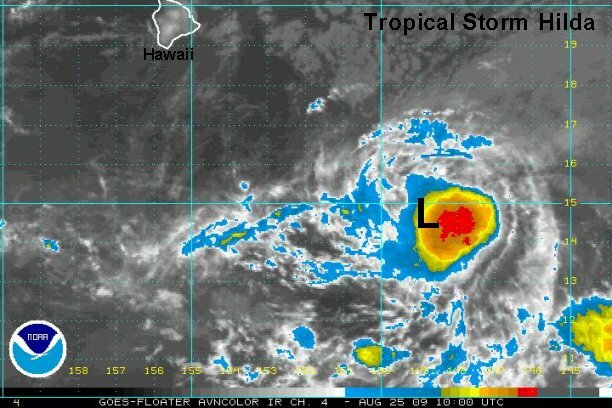 As of 4:00 pm edt / 1:00 pm pdt the tropical disturbance is centered near 13.4° N / 137.8° or about 1225 miles east southeast of Hilo, HI. Top sustained winds are estimated at 35 mph. It is moving west at about 10 mph. NHC named the system before crossing 140 w. This is now officially tropical storm Hilda at 40 mph. The burst of convection with tropical storm Hilda has grown over the past several hours. It still appears though that the circulation center is on the edge of the convection. Hilda should remain south of the Hawaiian Islands. As of 7:00 am edt / 4:00 am pdt / 1:00 am hst tropical storm Hilda was centered near 13.7° N / 139.4° or about 1115 miles east southeast of Hilo, HI. Top sustained winds are estimated at 45 mph. It is moving west at about 9 mph. Hilda's low level circulation is now under the thunderstorm burst. This will allow additional strengthening. Hilda should remain south of the Hawaiian Islands. As of 2:00 pm edt / 11:00 am pdt / 8:00 am hst tropical storm Hilda was centered near 13.8° N / 141.0° or about 1015 miles east southeast of Hilo, HI. Top sustained winds are estimated at 45 mph. It is moving west at about 9 mph. 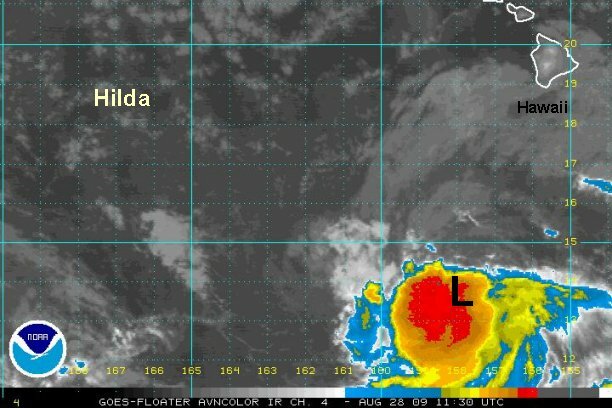 Hilda continues to slowly gain convection indicating slow strengthening. Hilda should remain south of the Hawaiian Islands. As of 9:00 pm edt / 6:00 pm pdt / 3:00 pm hst tropical storm Hilda was centered near 13.8° N / 142.6° or about 910 miles east southeast of Hilo, HI. Top sustained winds are estimated at 50 mph. It is moving west at about 12 mph. Hilda continues on a methodical, slow strengthening trend. At this rate, it may become a hurricane in the next 24 hours. 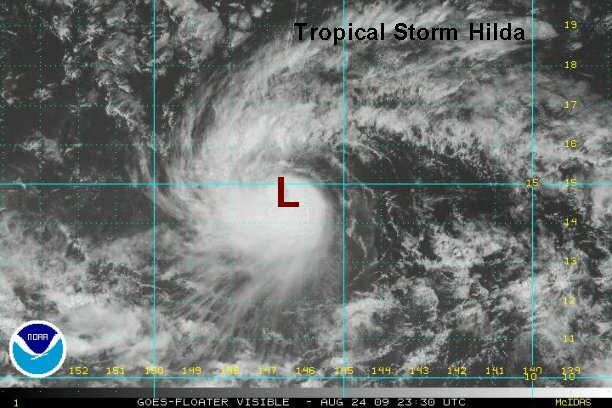 At this time Hilda is expected to stay 250-300 miles south of the Big Island. It's possible that some rain bands could affect Hawaii by Wednesday. The strongest effects should stay south. Look for surf to pick up on the south / east facing shores over the next several days. As of 8:00 am edt / 5:00 am pdt / 2:00 am hst tropical storm Hilda was centered near 14.3° N / 144.6° or about 785 miles east southeast of Hilo, HI. Top sustained winds are estimated at 65 mph (CPHC also estimates 65 mph). It is moving west at about 12 mph. Hilda has fought some wind shear over the past several hours. Overall, the strength has not changed much, neither has the forecast which keeps Hilda south of the Hawaiian Islands as a minimal hurricane. Some rain bands may affect the Big Island as Hilda passes to the south. Swell will be higher than normal on the southern and east facing beaches. As of 8:00 pm edt / 5:00 pm pdt / 2:00 pm hst tropical storm Hilda was centered near 14.9° N / 146.8° or about 640 miles east southeast of Hilo, HI. Top sustained winds are estimated at 65 mph (CPHC also estimates 65 mph). It is moving west at about 10 mph. 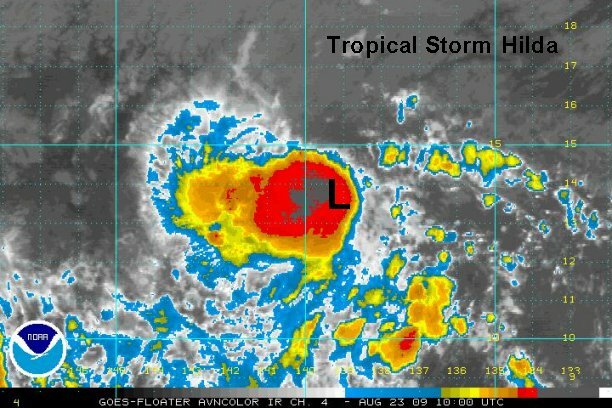 Tropical storm Hilda has decreased in intensity as cloud tops have warmed and the convection has decreased in coverage. Some rain bands may affect the Big Island as Hilda passes to the south. Swell will be higher than normal on the southern and east facing beaches. As of 7:00 am edt / 4:00 am pdt / 1:00 am hst tropical storm Hilda was centered near 14.8° N / 149.0° or about 520 miles southeast of Hilo, HI. Top sustained winds are estimated at 50 mph (and maybe a little less,CPHC estimates 60 mph). Hilda is moving west at about 12 mph. Tropical storm Hilda is in sorry shape. It appears that wind shear has seperated the low level center from the mid level. Convection is weakening and is only on the south side of the mid level circulation. As of 4:00 pm edt / 1:00 pm pdt / 10:00 am hst tropical storm Hilda was centered near 15.0° N / 150.0° or about 450 miles southeast of the Big Island, HI. Top sustained winds are estimated at 40 mph (CPHC estimates 50 mph). Hilda is moving west at about 10 mph. 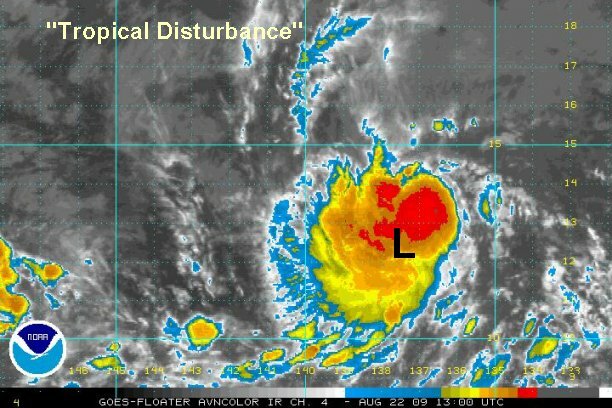 Although the exact center is difficult to pinpoint, it appears to be again embedded under the mass of deep convection. Some showers from Hilda may brush the Big Island as Hilda passes to the south. As of 8:00 am edt / 5:00 am pdt / 2:00 am hst tropical storm Hilda was centered near 13.4° N / 151.3° or about 480 miles south southeast of the Big Island, HI. Top sustained winds are estimated at 45 mph (CPHC estimates 45 mph). Hilda is moving west southwest at about 9 mph. 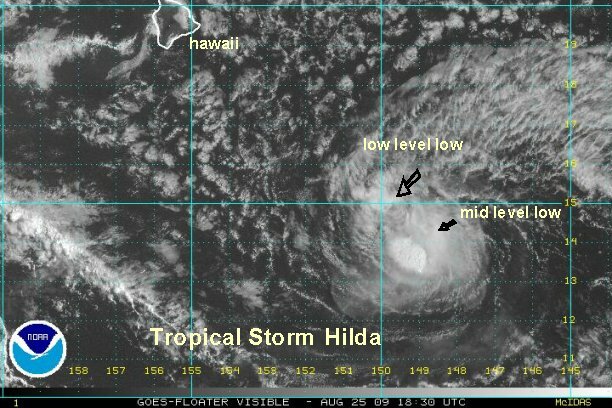 Hilda is fighting a little shear, but the overall appearance and strength has not changed much. 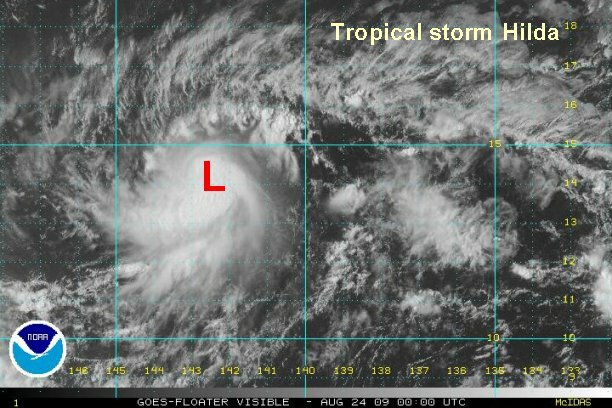 As of 5:00 pm edt / 2:00 pm pdt / 11:00 am hst tropical storm Hilda was centered near 13.2° N / 152.5° or about 480 miles south southeast of Hilo, HI. (Our position is a little different from CPHC's). Top sustained winds are estimated at 45 mph (CPHC estimates 45 mph). Hilda is moving west southwest at about 9 mph. 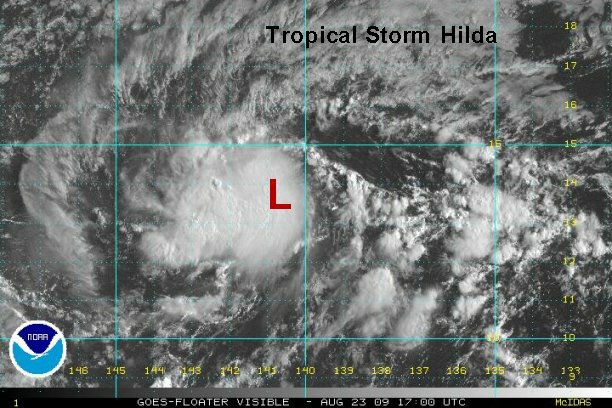 Wind shear has done Hilda in. 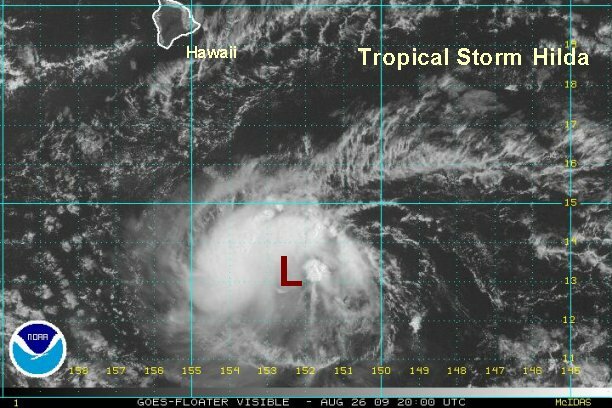 It is currently poorly organized well south of the Hawaiian islands. Unless there is a reformation of Hilda, this will be our last update. Hilda appears to be tropical storm again. A burst of deep convection is over the center and south of the low. CPHC declared Hilda dissipated....maybe just a little early. 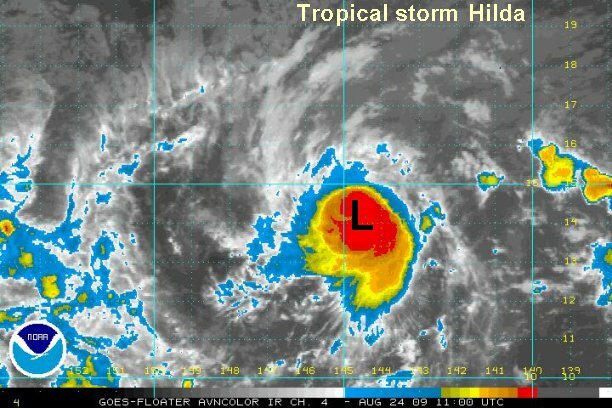 As of 8:00 am edt / 5:00 am pdt / 2:00 am hst Hilda was centered near 13.6° N / 157.9° or about 400 miles south southwest of the southern tip of the Big Island. Top sustained winds are estimated at 40 mph. Hilda is moving west at about 14 mph.